Iso Padre is a character in Octo Expansion. He is a giant isopod wearing sunglasses, a golden neck chain, and a black leisure suit, carrying a briefcase filled with toys. He also carries several childish accessories to further emphasize his playful side. Iso Padre's role in Octo Expansion is unclear, but it is shown that he is trying to get to Inkopolis. He also has a relation to objects called mem cakes. When he arrives onto the train, he notices Agent 8 has some mem cakes which he'll ask them to gather more. When Agent 8 completes a set of mem cakes, they'll receive a piece of gear that will be unlocked when the player completes the Octo Expansion. It's revealed that he was one of the test subjects in the Deepsea Metro, but has not completely forgotten his ordeal . He'll reward the Neo Octoling Gear set for the first three sets. For the seventh, eight, and ninth sets, he'll reward the Old-Timey set; the clothes worn by Cap'n Cuttlefish. For the final set, he will award the Conductor Cap. "I may not have much left, but I still have my health. Every day I pray I don't lose that too." "Don't turn your back on what's shabby. And don't embrace a thing because it's clean." "When you see a beauty in what's broken or run-down, then the whole world will be art." "Whether a thing is trash or treasure, well, that depends on iff you see it with love." "Dreaming too hard takes alot out of you." "Freshness advice, eh? A fine set of well-groomed whiskers won't steer you wrong." "The elder squid aims to teach me to rap. But I tell my tale slow, to no one else's boat." "I've been riding this train a long, long time, but a thing I've never left behind is myself." "If there's a final destination where we're all headed, we haven't reached it yet." "Stay somewhere long enough and you forget what it's like to be anywhere else." "I envy you your mem cakes, young squire. Both the memories and the cake." "Where am I headed? Oh, nowhere in particular." "I ride for the pleasure of riding." "C.Q. Cumber works his tail off morning, noon, and night. Me, I prefer the labor of the mind." "This train glides through the dark of the sea floor. You might be the headlight we need." "The well-dweller knows nothing of the ocean's breadth." "But the water's darkness? Now that's a subject with which it's intimately familiar." "You wish you had a confidant closer to your own age? I can sympathize." "I ride a subway called Desire, on a long and winding path to Inkopolis Station." 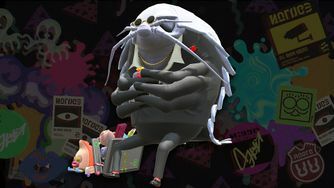 Iso Padre's name is a pun on "isopod", referring to his order, and "padre", Spanish for "father" (which can also be translated as "priest"). He reveals to Agent 8 that he only managed to obtain 2 mem cakes when he was still a test subject. In the Japanese version, he always starts the dialogue with "oh no...". Iso Padre talking to Agent 8. French Don Podio "Don" sounds like a mobster title. German Don Asselmo "Don" sounds like a mobster title. Asselmo comes from Assel (Isopod) and the name Anselmo. Italian Don Isopo "Don" sounds like a mobster title. If reversed, Isopo-Don sounds like Isopodo, "Isopod". This page has been accessed 39,729 times.